KABALE- Over 700 tea nursery bed operators in Kabale district have threatened to drag the National Agriculture and Advisory Services (NAADS) to court citing failure by the latter to pay them 48 billion shillings. The money in question accrues to the supply of tea seedlings to farmers in several districts of Kigezi and Ankole since 2015. In a letter dated, November 27, to NAADS, the farmers rejected the NAADS offer of 1 billion shillings part payment and demanded a full amount. The intention to sue was issued by the chairman South Western Tea Nursery Bed Operators Association, Mr Frank Byaruhanga, and other six people on behalf of the farmers. Mr Byaruhanga said court is the last option because they have exhausted all other avenues to be paid. “We have held several meetings with the Prime Minister, state minister for economic monitoring Dr, Minister of Agriculture over the issues of unpaid for tea seedlings but nothing has been done. Every aggrieved farmer in the tea enterprise should join us in this struggle so that we can get paid,” he said in a meeting by aggrieved farmers on Wednesday. The chairman of Kabale tea nursery bed operators, Mr Philip Zikampereza, urged farmers not to receive 1 billion shillings. “We cannot receive this money because it is too little compared to what we are demanding. They must have released this amount in panic after seeing a legal notice against them. Anyone that receives it means that he/she will not have any right to demand for full payment because the NAADS secretariat will use it as evidence in court to show that they paid all the farmers in Kabale district. Let us be patient until court orders for the full payment of our money,” Mr Zikampereza said. However, The NAADS Executive Director, Dr Samuel Mugasi, insisted that they paid only legally recognized farmers with whom they have contracts and that most of those threatening to sue the agricultural body are masqueraders. “We released the payment for verified tea seedlings in Kabale and only genuine tea seedling suppliers shall be paid. Those thieves that supplied no seedlings are hiding in the genuine supplier to defraud government shall be dealt with. Ask those claiming to have issued a legal notice against us their contracts with NAADS,” Dr Mugasi said. Kigezi region had for long existed without any cash crop not until 2008 when Government introduced tea growing there. Government invested sh20b in the project and it started from Kanungu district before coming to Kabale. Every district was supposed to begin with 22 million seedlings. Every tea farmer with two acres was supposed to get sh2m from Government. 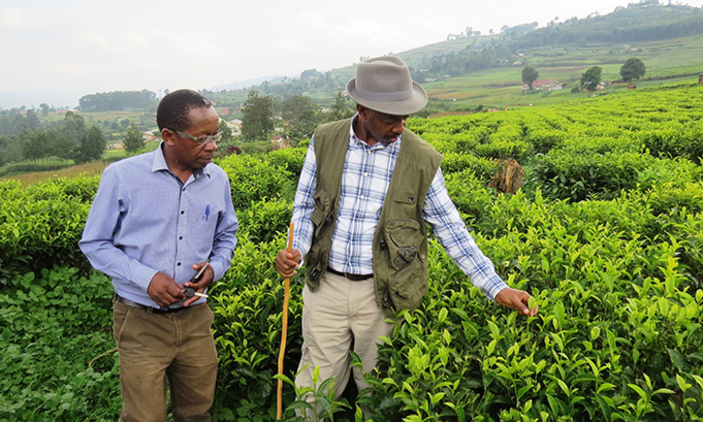 Kigezi Highland Tea Company was contracted to champion this enterprise in the region. However, the enterprise has since 2016 been involved in a series of challenges as farmers pulled ropes with Government over unpaid claims.